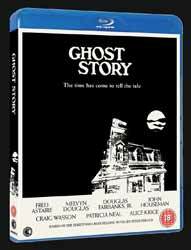 Ghost Story is a film from the early 1980s, based on a book by Peter Straub. It’s not surprising that Stephen King said good things about it at the time of the novel’s publication, because the style is very much King’s own – involving a secret horror from the past which catches up with the main characters in the present. Furthermore, as with many King stories, this film feels overly long. I think it is mainly due to the pacing which is consistently plodding. Like a working Shire horse it ekes out its energy without ever bothering to up-the-ante. Even when the action of a main plot point is played-out, there’s just no sense of urgency. At one point the monotony sent me to sleep – although I did wake up and pay more attention when the stunning young Alice Krige (who later found fame as the Borg queen with the Star Trek franchise) began walking around in her birthday suit. She is very alluring in her role. However, as far as actors go, Ghost Story showcases the twilight acting talents of Fred Astaire, Douglas Fairbanks Jr, Melvyn Douglas and John Houseman. Houseman must have pretty much gone straight from his atmospheric storytelling in John Carpenter’s The Fog in 1979, to a similar opening sequence in this one. Much as I’ve found fault in Ghost Story, it is an enjoyable film; just not one which would stand repeated viewing. Extras include, Author Peter Straub: Genesis (he’s more entertaining on the page than in person in this interview); a much better Story Development with Screenwriter Lawrence D. Cohen and Producer Burt Weissbourd; a Visual Effects short; a Photo Gallery; Actor Alice Krige on character/s Alma and Eva; and a Commentary by Director John C. Irvin.